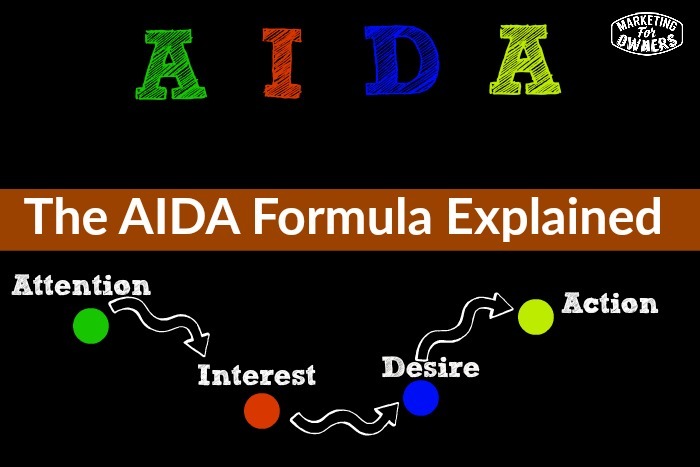 Now AIDA stands for attention, interest, desire, action. It has been at the forefront of successful selling processes for a long time. No idea where it came from, who first coined it, I’m sure you can look it up in Wikipedia, it doesn’t matter, it simply works. But people hear about it and forget about it and don’t use it. If they did, they would be more successful. It is very simple. Now this can apply to a sales letter, which would be a webpage where you add some crazy headline that says “Learn the seven secrets of aging that makes a 95-year-old look like a 45-year-old”, something like that. And it goes down at the end it says “Buy now, $10,000! Money back guarantee!” All that kind of stuff, that could be a sales page. But it could be something that’s posted out to you, a sales page could be done by direct mail, it could be sent by e-mail. However, it could be in a kind of brochure or something like that, it could be accompanying a form for a lead generation, it could be absolutely anything. But, most importantly, it can be used face-to-face as a presentation. So, let’s get down to it. Let’s assume you’re going to write out a sales page for a presentation, or make the formula framework for a presentation or an e-mail or a message you are going to send out to people. So number one, move away from interruptions, distractions anything like that; get out of the office, get away from home, go to Starbucks, go down to the beach, you don’t need the Internet for this, you can write this down on a pad, you can write it on an iPad, on your laptop, you don’t need to be connected. Go somewhere quiet, if necessary stick some earphones in, headphones on but if so, don’t listen to music with words because that will interrupt you. Just avoid, you need quiet. Now attention is in effect the headline and the lead paragraph, also known as the lead in sales copy writing. Quite obviously, the headline, the e-mail, the subject line or something like that, has to grab the attention. So in tabloid newspapers, that massive headline on the front on a magazine when they are on a magazine rack, that to be headline, that big picture, something needs to grab someone’s attention in the first place otherwise they are not interested. There has to be something in it for them. They are going to learn how to do something or other, you’ve got to get attention. Once they get past that headline, you don’t want to make it what it is click bait, so you’re making people click and go to wherever you are leading them. You know when you go on an ad in Facebook and you go to one of those super headlines, or it’s an image of a pretty girl and it says all the photographs, the models didn’t know the photographer captured, and you go to them and they’re completely different from what you expect. It’s called click bait, so not very nice. Now you’ve got their attention, now you’re working on the interest. Here is where you’re going to list out the facts to show where they are now, their current position and how this that you’re going to talk about will benefit them. So every fact that you list is going to be in a way that benefits them. I saw somebody offer a good example of this where they explained about instead of commuting to work, how about getting a helicopter to work. You could say they would be talking to wealthy people, but one of these would be save, cut 30% off your journey time and get to your desk quicker. So they get to your desk quicker, it doesn’t say “A helicopter is 30% faster”, it puts it in your point of view, that kind of thing. 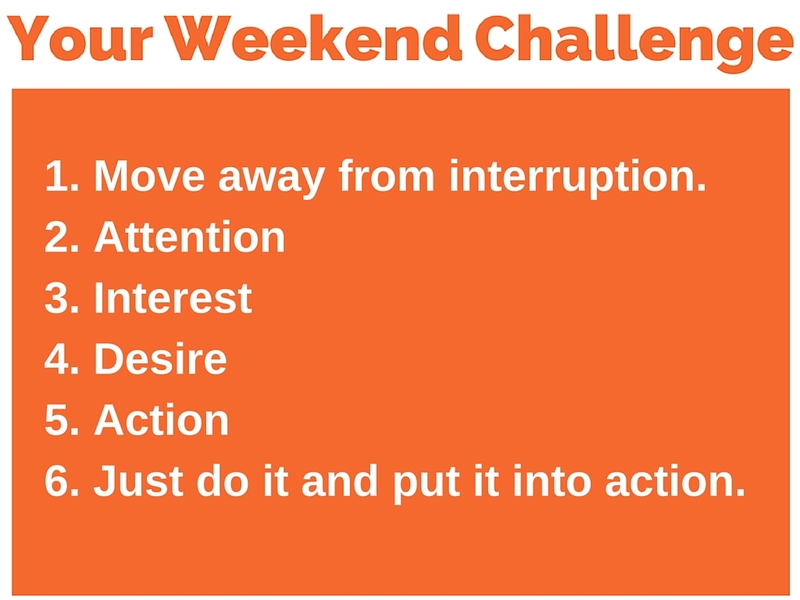 So remember, list out the things to get their interest. Give those astonishing facts that make it sound interesting to them as an individual. They’re not interested in what anyone else thinks in the world, they are just interested in how it will affect them. And remember if they are for a company, .if you are doing a face to face presentation, for a company, you are still selling to an individual person. They may be representing a company, so you can put it in words that affect the company, but you are still talking to an individual person. There is no real B to B, B to C, it’s actually you sell to one person at a time. Okay? Ohh, that’s a meaty bit. Now here is where you build up, you’ve got their attention, you’ve got their interest, you’ve piqued their interest, now you want to their desire, okay. They need to want this. So you’re going to explain how valuable their time is; obviously this will vary dependent on what you are presenting. How valuable their time is, how wonderful they are, how wonderful they are doing whatever they currently do, that this will improve; what they’re missing by not having this, what they are lacking. And how it would look, or how they would look once they do have this and how envious their friends and their colleagues would be and how it would put them at an advantage because the others they know would have it, etc., Tempt them. Now you can think of, if you are a gentleman, it is quite easy to think of a beautiful temptress lady. Everything that goes through your mind that invokes desire and that’s why you then fancy her. You’re not going to get anywhere, but that’s, imagine if you could get that across in words, in selling your product or your service and yes you can, you really really can. This is, to be honest, where most people fall down. Generally everyone can talk up a storm about their product, their service, but in my experience, remember I used to train people as door-to-door salespeople from scratch and I worked with others. Some of my colleagues would talk someone to death until they gave in and bought it, and that could take forever, but they just hoped that eventually they would do it because they were too scared to ask for the sale because they thought what happens if the person says no? Then it’s all done, it’s all wasted. But you must tell them what you want them to do. And of course, this isn’t always a sale, this might be to sign up, to opt in, to go to an event, to register for something, for a course, to get a free book, who knows? To attend a tele seminar, webinar, it could be to buy something, but whatever you need them to do, you need to tell them what to do and when to do it. So, “Register now”, “Order before…” “Buy within 24 hours” or “Buy now, add to cart.” Something like that, you need to tell them because if you don’t do that, then they’re not going to do it. And you can add time limits, you can add scarcity. So if you’re talking face-to-face, you can say, “You need to register now, because there is only 20 places and we need to know every r person that’s coming, so that if someone is not coming, we can let someone else get in off the waiting list.” Etc. And by the way, don’t lie with any of this, don’t tell fibs, be truthful; it’s never necessary to lie at all, be truthful, be confident in your product. Number six, final one. Do it. It’s not actually a part of the AIDA thing, just do it, put this into action, do it, do it, apply it, try it. If you do a sales presentation to anyone, write down the kind of things you say, the framework and now alter it to this formula. It won’t take you long, try it, it will improve, it will get you consistency, it will get you more sales, it will make your life more enjoyable and it will make you more profit. Why wouldn’t you? 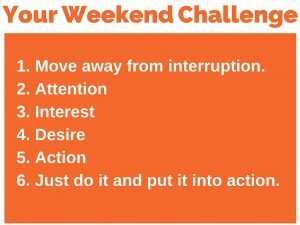 Go grab your pen, your pad, pick a time over this sunny weekend and get to those headphones on, quiet corner of the garden, give it a go. Have a good weekend anyway. I’ll be back on Monday.